The Conservatives - Terrorama. Vinyl LP. Bleep. 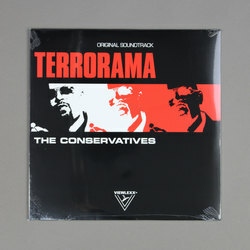 Appearing for the first time on vinyl, The Conservatives’ soundtrack to Dutch film director Edwin Brienen’s 2001 ‘Terrorama!’ gets a release on Viewlexx. Telling the story of six mentally distressed people on the quest for psychological freedom, Brienen’s work has achieved cult status for its dark commentary on the ills of humankind and society. Known for their collaborations under the ‘The Parallax Corporation’, I-F and Intergalactic Gary released one single as The Conservatives back in 2003, recording their work for the ‘Terrorama!’ project a couple of years prior. The soundtrack for ‘Terrorama!’ features dark, synth-laden atmospheres and elements of electro and future terrorism. For those interested in soundtrack artists like Tangerine Dream and Oneohtrix Point Never.